How is One Photo Booth Different from Another? What you can’t see can hurt you when it comes to renting a photo booth. The equipment under the hood directly affects the photo quality, print quality, speed and the overall enjoyment of using the photo booth. The photos from the camera are passed on to the computer, processed, formed into your finished images and sent to the printer. A weak link anywhere in this chain can dramatically affect your photo booth rental experience, so let’s take some time to review the equipment options available to photo booth owners and see how they can affect your event. The first link in the photo booth rental chain is the camera. Options for photo booth companies range from low end webcams to high end (and high priced) DSLRs. Any of these cameras can work in a photo booth setup, but the quality increases as the camera type moves up the spectrum. The consumer camera industry has led us to believe that more megapixels yield more quality in our images. It’s partially true that a camera with more megapixels can deliver higher quality images, but the quality of those pixels is more important than the quantity. The real reason that quality increases from left to right on the spectrum above isn’t due to megapixels, it’s due to the growing image sensor size. A larger image sensor can accurately capture more detail. The sensor in a DSLR (Digital Single Lens Reflex) is often 25 times the size of the image sensor in a point and shoot camera. Having a camera with a larger image sensor is much more important to quality than a camera boasting many megapixels. DSLR cameras are the clear winner when it comes to image quality and speed. Canon and Nikon are the main brands of DSLR used by photo booth companies, and DSLR cameras from both brands produce breathtaking images. Just before DSLRs on the quality spectrum are compact point and shoot cameras such as the Canon SX50 that copy the DSLR size and shape but don’t offer the same speed or image quality. Cameras toward the lower end of the spectrum offer low cost and the smallest size. An iPad is a camera, computer and a touchscreen in an extremely sleek package, but the image quality of a booth that uses an iPad will be far less than the quality of a booth that uses a DSLR. A photo booth rental company that uses a camera on the lower end of the quality spectrum may charge lower prices to compensate for the loss in image quality. Next to camera quality, lighting is the most important factor in capturing a great image. Professional photo booth companies will use self-contained studio flash units to light their photos. Consumer grade florescent or incandescent bulbs are preferable to no light, but these light sources can often produce harsh unflattering shadows characteristic of amateur photography. Ask: Do you use a DSLR camera? If the answer is no, ask “Why Not?” and see if you like the answer. Also ask to see various images from different events. Just about every professional photographer owns a DSLR camera but not everyone has mastered adjusting the settings to create appealing photographs in different environments. What We Use: Photo Booth Plus uses Canon DSLR Cameras and Paul C Buff AlienBees professional photo lighting. Our ultra-portable open air booths use a Beauty Ringflash that gives a shadow free look regularly used in portrait and fashion photography. Our equipment costs more than some cheaper alternatives, but our flattering lighting and image quality is regularly praised by event planners and professional photographers. We have consulted with professional photographer Abby Rose who has helped us to incorporate professional photography techniques into our photo booth process. Is There a Computer Running the Show? We’re using the term ‘computer’ broadly to include the overall set-up of the booth’s electronics including the computer, software and monitor. One of the questions we’re asked regularly by people considering a photo booth rental is, ‘Why do I need a photo booth when I have a photographer?’ A photographer captures the essence of your event, along with a healthy dose of the photographer’s experience and vision. A photo booth is an entertainment experience that generates a memorable keepsake. Preparing for the moment when the camera will snap and the instant gratification of seeing and sharing your photos are both integral parts of the photo booth experience. Some photographers offer an open air portrait station where the photographer operates the camera as people pose in front of a backdrop. The photographer’s experience means this set-up is likely to yield the highest quality photos but it technically isn’t a photo booth, because the photographer is controlling the process and there usually isn’t instant access to the photos in printed or digital format. 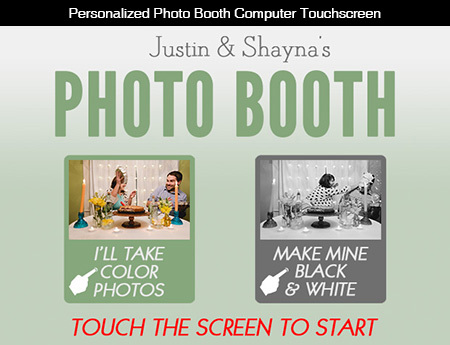 The photo booth experience is heightened by any feature that empowers the booth users to have more control over the process. For this reason, some photographer created set-ups have been made more like a photo booth by adding a release button for the camera, so one of the guests can trigger snapping the photo. With a contemporary digital photo booth, the photo session is generally started using a button, or a touch screen, and the process includes a countdown so all guests know when the photo will be taken and can prepare their poses and/or props. There’s no right or wrong choice as to which operations style is best, as long as you are comfortable with the features and the amount of control your guests have over the experience. The speed and reliability of the computer and booth software directly affects the photo booth experience, but it’s difficult to give guidelines for what brand, model or type of computer will be best. Even two of the exact same computers may have various software and hardware upgrades that greatly effect ultimate performance. As a customer it’s less important to know about exactly which computer components and software are being used, and more important to know how the booth experience is affected by the company’s computer system choice. To gauge the computer’s performance, ask the company how long it takes for a photo booth session to print once guests are done taking each set of photos? This will depend on the speed of the printer, but also on the speed of the computer. Also, look for third party reviews (beyond the company’s website) to see if there is praise of fast, high quality booths or complaints of booths with poor or slow operation. A monitor is one of the most useful upgrades to a photo booth setup. The monitor can be used to give instructions, show a countdown to when the photo will be taken, or to add additional customization to the booth experience, and make your booth rental fit with the overall theme of your event. When the booth software is live-view capable, users see a live representation of what the camera will capture that is helpful to adjust outfits and props, and make sure that all guests are properly within the frame. Having touchscreen enabled monitor also allows the addition of interactive features like sending photos to email or social media networks. Some older booths don’t have a monitor, but instead a digital LED readout with a countdown. The guest presses a button and the digital LED screen shows the countdown to each photo being taken. If you’re interested in having a live view, make sure you ask if it’s available. Ask: Can guests operate the booth on their own? Does your booth offer Live-View? How long does it take for each session to print? All of our booths are fully automated with on screen instructions, countdowns, and touch screens with live view. We use computers with at least 2 Gigs of ram and the latest generation Intel Core i5 processors. We originally used tablet computers with a built in touchscreen. In our newest booth model we’ve switched to using faster computers with an external touchscreen monitor and our printing time went from more than 30 seconds per print to less than 10 seconds. You won’t see the computer, but it’s extremely important! When it comes to selecting a photo booth printer there are two main options to choose from, Dye-Sublimation (Dye-Sub) or Ink-Jet. Dye-Sub printers fuse dye from a ribbon onto paper which is then coated by a clear protective layer that resists smudges and scratches. Dye-Subs are praised for their continuous tone that closely resembles that of darkroom exposed photos. Ink Jet printers are created by spraying tiny dots of ink on paper. Early Ink Jet models were criticized because they could not replicate the quality of color available from a Dye-Sub and you could often see visible dots and pixilation in some areas of the print. Certain brands of Ink Jet prints require drying time to avoid smudges, and can fade in sunlight if the right combination of archival ink and paper is not used. Professional Ink Jet models have overcome many of the issues above. They use more shades of ink to create a wider color range, and have extremely tiny dots that aren’t visible without magnification. With the right ink and paper choices the prints can be smudge free and last for years. If you are offered a photo strip that is larger than 2x6” it’s generally from an Ink Jet printer. Most photo booth rental companies with use Ink Jets use consumer, not professional models, which still print with great photo quality but often have durability issues. We’ve listed some of the main advantages and disadvantages of Ink Jet and Dye Sub printers. The Positive: If you have the exact right combination of a professional printer, archival ink and paper Ink Jet prints can look better than anything else on the market. 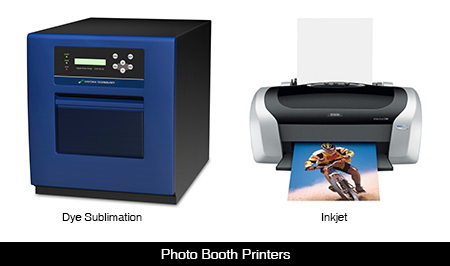 Ink Jet printers can also use any size sheet of paper which means photo booth strips can be larger than 2x6”. A more common size for Ink Jet strips is 2x8” because the strips are cut from 8 x10” photo paper. Ink Jet printers are far better than Dye-Subs for reproducing small detail in text and logos. The Negaive: Ink Jet printers can print relatively slow (30 seconds to 2 minutes per print). Ink Jet images may smudge or fade with time. Ink Jet printers run out of ink cartridges one at a time, so during the course of your event you may have prints that have streaks or are missing certain colors until the cartridge is replaced. The changing of cartridges may result in downtime at your event. The Positive Dye-Sub printer quality most resembles darkroom developed photos. Professional grade Dye-Subs are generally used by photo booth companies (as well as the mini photo labs in drug stores) because of their extreme speed and print capacity. If the ribbon and ink needs to be changed, it will usually be once per event. Dye-Sub prints don’t suffer from smudging or fading like Ink Jets can. Although the paper size is limited, most people are used to the standard sized 2x6” strips and 4x6” photos. The Negative Page size and selection is limited to standard sizes. Dye Sub printers will have trouble reproducing small text and intricate logo detail if they are sized smaller than the printer can handle. High end professional Ink Jet printers offer a wider color range than Dye Subs. How will the advantages and disadvantages of each type of printer affect your photo booth rental? The Bottom Line: Most professional photo booth companies use Dye Sub printers, they offer industry standard photo quality, are fast and reliable. You may save some money by going with a company that uses consumer grade Ink Jet printers. However, that cost savings can be a gamble on the quality and durability of the prints. We use professional Dye Sublimation printers that print beautiful full color images in less than 10 seconds. You have the option to choose between 2x6” strips or 4x6” prints. Our printers hold between 600-1400 strips on each change of supplies, so if we have to change the ribbon and paper it will usually only be once during the course of your event.